You have always been very helpful and prompt whatever my requests have been. 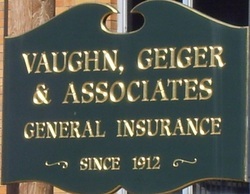 Vaughn, Geiger & Associates Inc., was founded in 1912 by F.E. Vaughn. Mr. Vaughn along with his three brothers were awarded a franchise from the Home Insurance Company, one each for Henderson County, Webster County and Union County. F.E. Vaughn ran the agency until 1947 when his son-in-law, Bill Geiger, sold his farm in Waverly and joined the agency. At that time the agency became known as Vaughn & Geiger. In 1963 when F.E. Vaughn died, Bill Geiger ran the agency until 1968, when his son Mike Geiger became a partner. Chapman Ruark joined the agency, in 1978 and became a partner in 1981, at which time the name changes to Vaughn, Geiger and Ruark. Bill Geiger retired in 1986 and passed away in 1991. In 2001 Matt R. Lovell joined the agency, and in 2004 became a partner. At that time the name was changed to what the agency currently operates as, Vaughn, Geiger & Associates, Inc.
Champan Ruark retired in 2002 and Mike Geiger retired as an agent in 2004, but stayed on as an operating advisor to the agency. Up until 2010, Nicole Geiger Welden had been a silent partner. In 2010 she began working directly in the business. Over the years Vaughn, Geiger & Associates has acquired several local independent agencies in Union County. These include: McCarty, Young & Stoll, Price Insurance, Skinner Insurance, Barker & Sugg Insurance, Corw & Mason, & Clements Insurance Agency. Vaughn Geiger & Associates is proud to be a part of Union County for 100 years. Specialzing in Oil & Gas, Farm, Commercial, Home, Auto, Bonds, Life & Health Insurance. We are a Complete Insurance Service Agency.